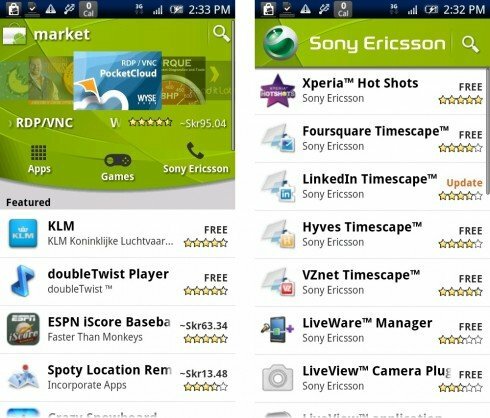 Try opening up Android Market on your Sony Ericsson device and instead of finding "My Apps" on the menu, you'll be transferred to a Sony Ericsson channel filled with junk apps the manufacturer wants you to download. Now you'll have to open up your menu just to find the damn apps you downloaded. Sony says this new development is "carrier-dependent" so there's still a chance your operator won't roll this out, but it looks like certain phones have already been leeched. When will operators and manufacturers realize that they're killing the platform with "innovations" like these? If an idea has proven successful (Apple iPhone and the closed shop) then there are those who try copy the success. They are missing that some successes can not be copied because the potential customer will want the original and nothing else. If you want easy connectors for your garden hose you use Gardena, if you want a walled garden for your Phone you get iPhone. Period. PS: Gardenas patent have run out and there are now compatible copy cats. But I still would not buy them.